Jack Russell Terriers are mischievous and adventurous in the extreme! They are prone to dig and bark and are best suited to someone who is active and likes to be entertained! They are generally good with people and children, can be trained to tolerate other animals, but do not like rodents. Remember they are hunting dogs at heart and may sometimes have difficulty in resisting the family cat! 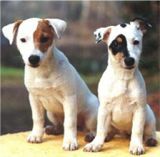 The Jack Russell Terrier was developed in the mid 1800's by Reverend John Russell of Devonshire (hence the new name since April 2003 'Parson Russell'). Their job was to follow the hounds when fox hunting and get the fox out if it went to ground, in order that the hunt could continue. Jack Russell Terriers are brave, confident, boisterous and mischievous little dog - and as a result of his constant quest for activity he often finds himself in the middle of trouble. He will require plenty of attention! 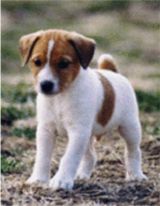 Jack Russell Terriers are quick to learn, but will always try and do things his way! Consistency will be the key to success and a Jack Russell will always try to win you over with his cheeky charm! 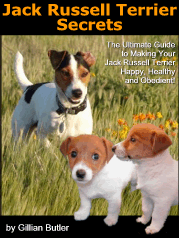 Discover How to make your Jack Russell happy healthy and obedient!